I finished The Mortal Instruments series a couple of months ago, and while I most certainly enjoyed it, it definitely had its highs and lows, a mix of 3, 4, and 5-star moments. I put off reading The Infernal Devices because I thought my experience would be the same. They were more well-written, more well-plotted, the setting more richly-imagined, with the characters more finely-drawn. They surprised me, had me looking forward to waking up each day so I could start reading, had me fighting sleep every night so I could keep reading. 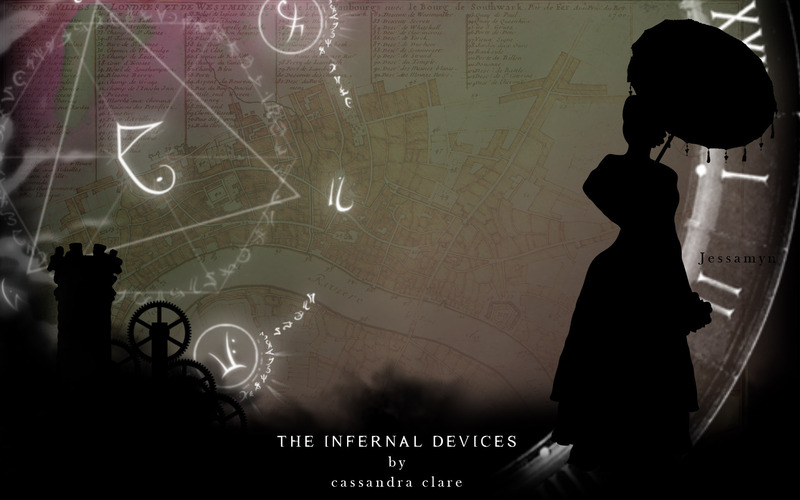 The Infernal Devices is a prequel trilogy to the Mortal Instruments. It takes place in Victorian London, and tells of the demon-hunting ancestors of characters I’d already come to know, with a few (immortal) characters actually appearing in both sets of books. The basic plot set-up is similar: girl with no knowledge of the supernatural world is suddenly thrown into danger, she learns of her mysterious heritage while helping to fight demons, and along the way meets a cute boy. The real draw to this series, of course, is the thing all my favorite books have in common: well-written characters. The secondary characters were all fine and good, but Will, Tessa, and Jem absolutely captured my heart. Their relationships were so perfectly constructed. I will always, always, prefer relationships that start as friendships, the long and drawn out sexual tension, to be culminated in some beautifully-written scenes where … but I don’t want to spoil them for you. I hear that people are sick of love triangles. I’m not one of those people. Love is messy and complicated and though I definitely practice monogamy in my own life, I think I am a bit more sympathetic towards those who do not. I think monogamy is a societal construct, not something that comes naturally to human beings. Loving more than one person makes perfect sense to me. And Tessa/Will/Jem–what a well-written love triangle. To have each of the people in it love each of the other people in it so unconditionally they’re willing to sacrifice their own happiness—well, let’s just say Edward/Bella/Jacob this is not. I cried when anything happened to Will or Tessa or—oh, Jem. Jem’s choice at the end I had guessed, from already finishing City of Heavenly Fire. I sobbed. Sobbed. (In an airport. In front of dozens of people and my mortified boyfriend). My one bone to pick with this series: Clare once again has the problem of spending too much time on secondary characters. I liked Charlotte and Henry and Sophie and the Lightwood brothers well enough—but I really didn’t need so many scenes of them all falling in love with each other. My interest lay firmly in Will, Tessa, and Jem, and every scene without them in was just not as good. Secondary characters should be just that: secondary. The epilogue gave me goosebumps. These books are everything I aspire to as a writer, and everything I am working towards. < Previous A Magician or a Workman?